Designer Karim Rashid has created a bottle that filters tap water as the user drinks it. Called Bobble, the product features a replaceable carbon filter, available in six colours. Each cartridge can filter up to 150 litres. Move Collective, LLC, today introduced bobble (www.waterbobble.com), a stylish, patented water bottle that filters water as you drink. Bobble's ingenious design removes chlorine and organic contaminants from municipal tap water. In doing so, bobble replicates the experience of drinking crisp, clean portable water without incurring the significant costs – environmental and monetary – associated with plastic water bottles. Bottled water has been one of the fastest-growing sectors in the beverage industry. Americans spend over $15 billion every year to satisfy their thirst for it. Most plastic bottles are casually discarded, ending up in landfills, in oceans and on sidewalks. Bobble is made from recycled plastic and is free of BPA, Phthalates and PVC. Bobble is reusable. It is intended to be an everyday accessory rather than an impulse decision. Its recommended retail price is $9.95. The low retail price of bobble and its filters is intended to mitigate the cost of regular bottled water consumption, which can run into the hundreds of dollars annually. A single bobble filter equates to at least 300 water bottles, which lessens the environmental impact that single-serve bottled water imposes. "We all love bottled water. But our bottled water habits are simply unsustainable, both from an ecological perspective and as a matter of financial common sense," said Richard Smiedt, founder, Move Collective, LLC. "We set out to design a bottle that would improve the taste of tap water to the point where consumers could turn on their faucet, rather than open their wallet. Our patented filtered water bottle achieves that goal." Bobble is made in the USA. It was designed by renowned industrial designer Karim Rashid and features an iconic shape. Bobbles are sold in six distinct colors: green, red, blue, magenta, black and yellow. Carbon filters are a proven, powerful chemical absorbent. As water passes over them, the negative ions of contaminants are drawn to the carbon granules, where they remain. The filtered water has a cleaner, crisper taste and meets or exceeds NSF International Standard 42, the standard that governs public and private drinking water. 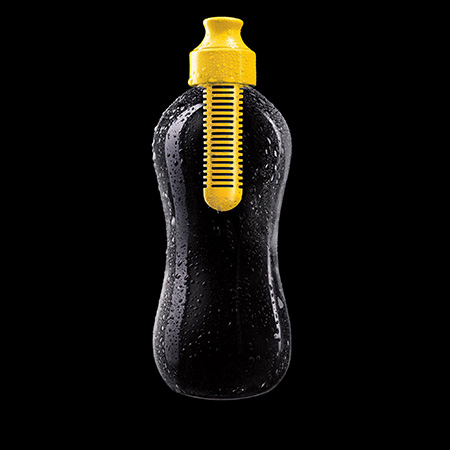 At first use, consumers should fill their bobble with water and squeeze it through one time; this gets rid of any loose carbon. The activated carbon filter requires no maintenance thereafter. It should be replaced every two months or after filtering approximately 40 gallons, or 150 liters, of water.